Peer groups are something top entrepreneurs, CEO’s and lifelong learners have been using for decades to bring out the best in each other. It provides an opportunity for members to discuss issues and work together to solve problems. On this episode of the Dynasty Leadership Podcast, Jim Stelten of BerganKDV joins the show. Jim discusses his role in facilitating and operating three different forums (CFO, Risk and EOS) to help them share ideas. BerganKDV is a professional services firm that is spread out across the Midwest. Their goal is to solve problems and create opportunities for clients. They work within the fields of finance, human resources, IT, and C-Suite executives. They look to save clients time, reduce risk, and impact profits. Jim has been at BerganKDV for 10 years and is currently the Twin Cities Market Leader for the firm. Before that he spent fifteen years as a CPA on the audit side before moving to private industry for ten more years working in a variety of C-Suite positions. Jim personally facilitates five different forums. He keeps his groups between six and eight people allowing a trust to build which results in more honest and private sharing. They generally meet every sixty days and discuss currents issues. The point of the meetings to is to provide a new environment to create group share and bring out the best in each other. Members have an outlet to network, brainstorm, and share accomplishments with business people outside of their own companies. Dynasty Leadership focuses on helping visionary leaders map out their strategy and take the bold steps necessary to grow their business. If you are one of those leaders, I would welcome a conversation with you to hear your story. Call me at 612–845–2076. [1:40] Jim is a master networker and shares how he keeps track of it all. [2:45] What does BerganKDV do? [4:05] What did Jim do before working with BerganKDV? [4:50] How did Jim get started utilizing peer groups? [7:20] Jim explains some of the benefits of attending a peer group. [8:45] These peer groups can become really vulnerable places where leaders can share what their day-to-day looks like. [9:55] Todd shares an overview of how to create/start your own peer group. 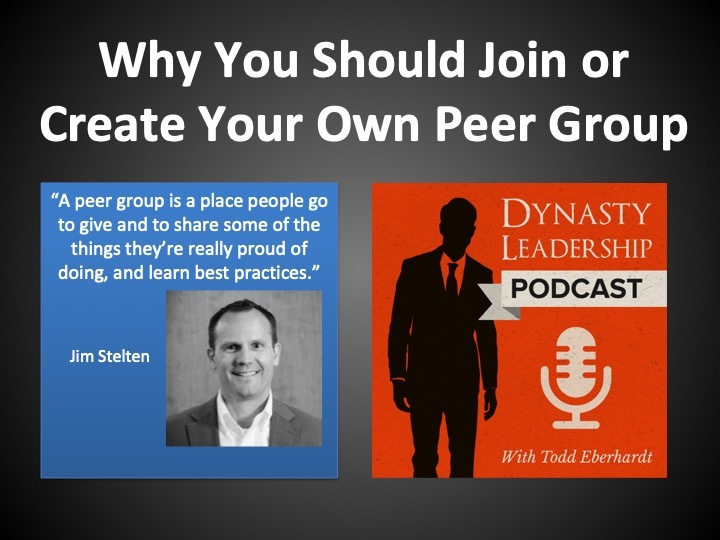 [13:35] If you’re in a peer group, you have to participate! But don’t worry, there are facilitators there to help shy people get out of their shell. [16:25] What does it take to make a peer group work well? [20:45] Jim explains what a ‘debriefing’ situation looks like. [23:35] What does Jim do in between meetups to keep everyone prepared and set for the next group meeting? [26:00] Jim shares why he values peer groups so much. [28:40] What kinds of lessons has Jim learned along the way? [31:10] At the end of the day, you feel like a family.